The SmartAVI VX3000 extends any PC equipped with XVGA and PS2 keyboard and mouse signals up to 10km with singlemode fibers. The VX3000 consists of a Transmitter unit and a Receiver unit. These two devices enable long-distance, loss less transmission of DVI video signals between a digital video source and a digital display device. The VX1000 is equipped with DVI-D(Digital Visual Interface) connectors for a single-link and option keyboard and mouse. The VX3000 receiver is small enough to be attached near a projector. With the VX3000, the maximum distance between the source and digital display is is 10km (32,800ft) singlemode fiber. KVM extension where an exceptional image quality is required. Medical - using computer tomographs generates strong magnetic fields, which make it impossible to use monitors. 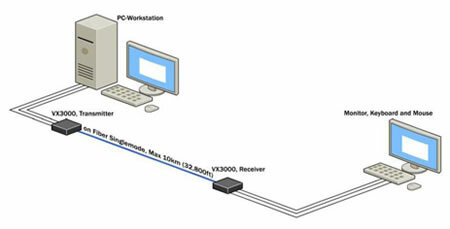 Using fiber optic cables allows remote location of monitors that require a very high screen resolution. Basic device to remotely locate Monitor and Keyboard/Mouse. Dimensions 6.063 x 8.937 x 1.75 in.